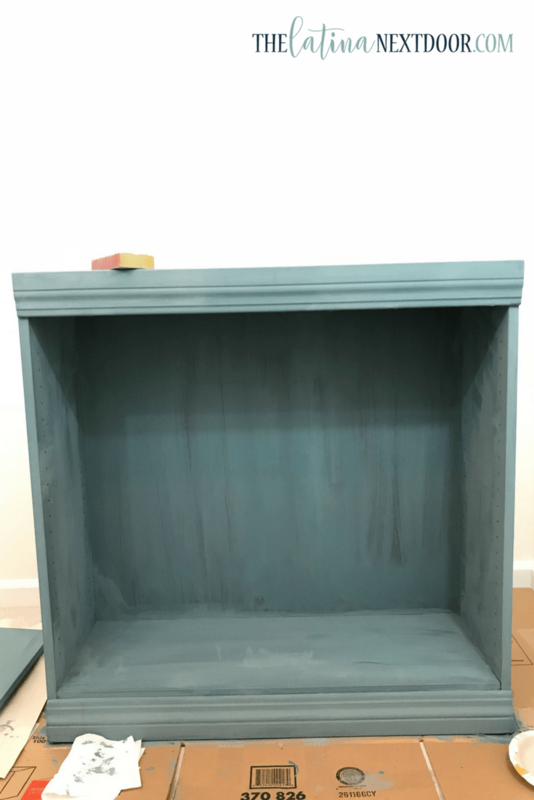 I have a wonderful transformation to share with you today and since this is my first time using Milk Paint I thought I would take you a long the journey and share my first experience and how I applied it to my 2 bookshelves that I scored for FREE and will be using in my Craft Room Challenge! 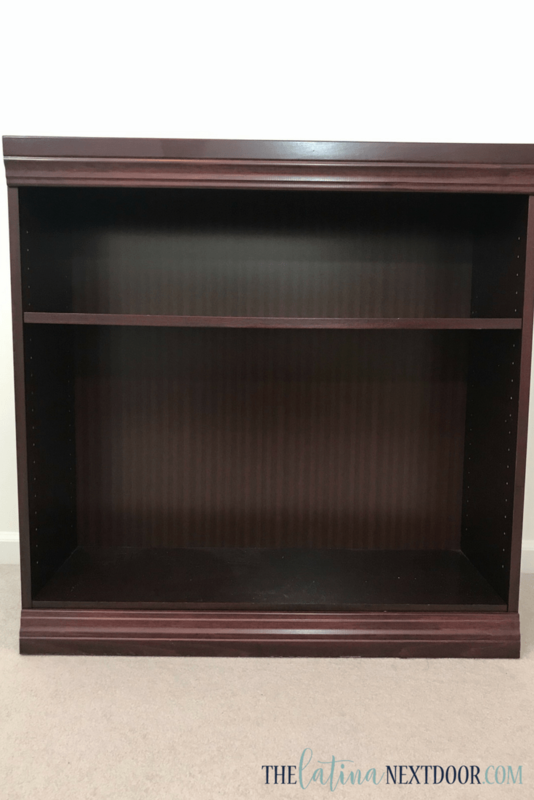 As you know I have been working on my craft room and one of the items I planned on using were these bookcases.I used to be in Commercial Property Management and sometimes when our office tenants would move out they would leave lots of goodies behind. Two of these were left in an empty space to die…. The horror! 💡If you wish to do this remember you can easily find nice bookshelves at your local thrift stores or at used office furniture warehouses for a steal! That’s where finds like this usually go, I just made it to the shelves before they got there for re-sale! Heck yeah! So I gladly took the burden upon myself to take them home. They have stayed this way for about 4 years now. I never really knew what I would end up doing with them or how I would transform them. 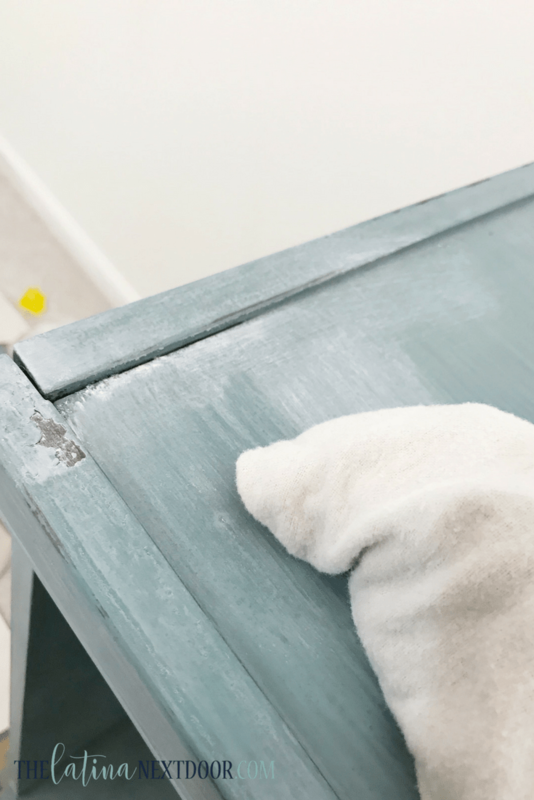 But, recently I came across Jami Ray and her tutorials on how to paint with milk and chalk paint and boy was I hooked! And after finally comparing so many decor styles out there, I finally decided which one is me. I call it “Hamptons Farmhouse”. So I quickly ordered my paints from Jami Ray and got to work. 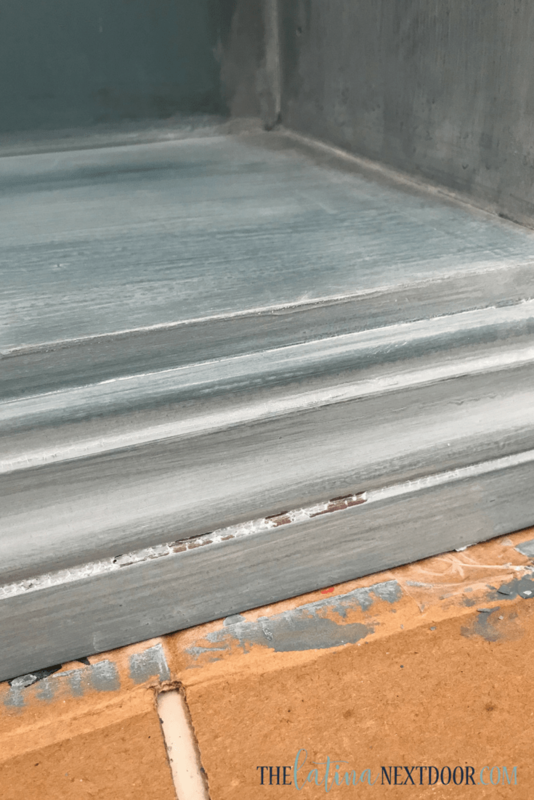 If you have never used milk paint before, it comes in powder form. You mix equal parts of powder and warm water and shake until it’s the consistency of a melted milkshake. It can be done easily in a mason jar. *The color I used was Moody Blue and I actually found a REALLY good chalk/wax brush online that is SUPER affordable. 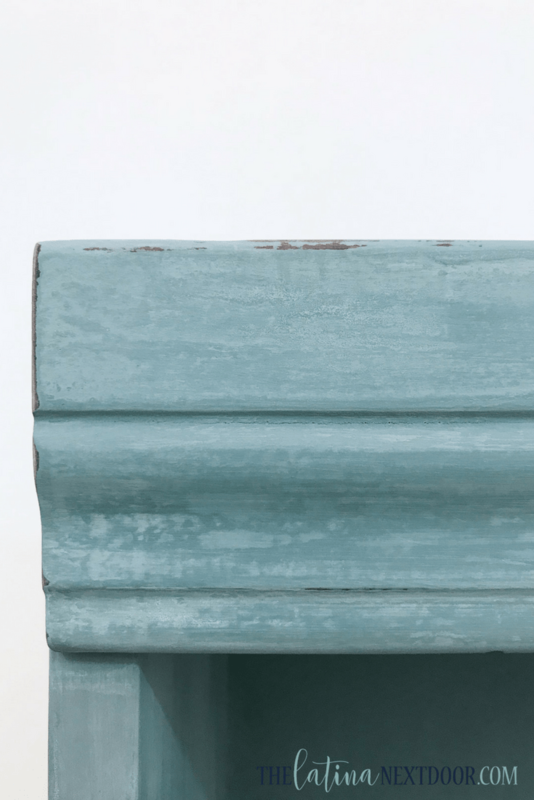 Milk paint is great for distressed and chippy finishes. Since my bookshelves were super slick with top coat, I gave them a light sanding and used Extra Bond in the milk paint mixture so that it didn’t chip too much. I like a little bit of distress but not that much. However, even after I painted them 2 times, the paint still looked streaky and uneven. I’m not sure if it was the brand of paint, the fact that I only used Extra Bond in one of the applications (since that’s what it says to do) or I didn’t know what the heck I was doing. So I paused and after freaking out a little bit I just kept going…. 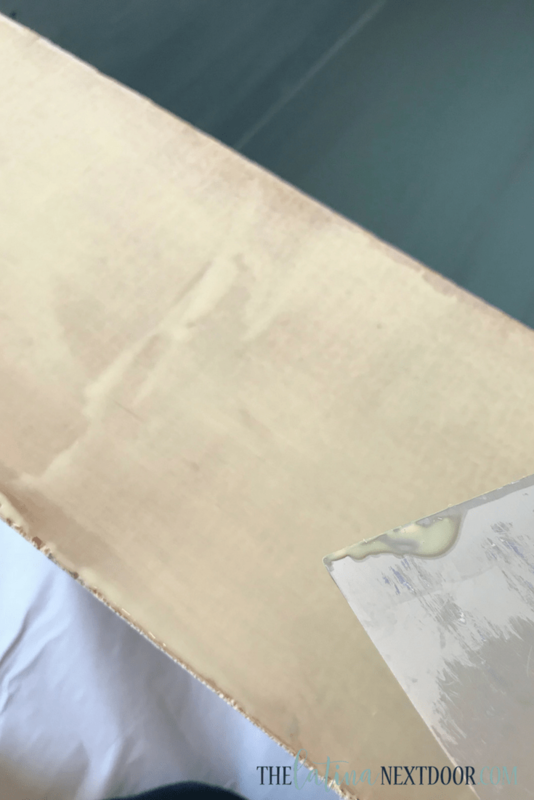 I sanded it down with a 220 grit sandpaper and here is a close-up of how the paint looked after the sanding. I distressed edges and random areas here and there. I knew I wanted a beachy and light feel so my plan was to add white wax and make it look aged anyway….So I held my breath. I then used Debi’s Design Diary’s DIY White Wax. The little one is the white and the large is the clear wax that I apply later. I used my awesome and cheapo brush to apply the wax. Tip: Always have one brush for paint and one dedicated to just wax when using these brushes with these products this way any oils left on the brush won’t mix with any paint. Plus you can always store your wax brush in an air tight ziplock bag in between uses so the wax won’t dry out, this means you need an extra. And a soft cloth to wipe off the excess soon after. I let dry for another 24 hours and the change was amazing! You can see it was starting to chip a little and it was gorgeous! I decided to add another element: shiplap. So I cut down some shiplap strips I had leftover from another project and glued them to the back. 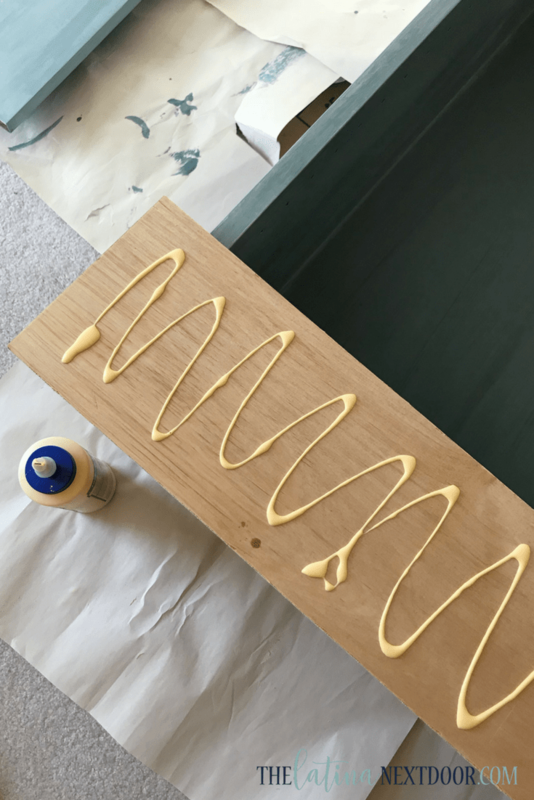 I smeared the glue evenly along the shiplap with a spatula…. 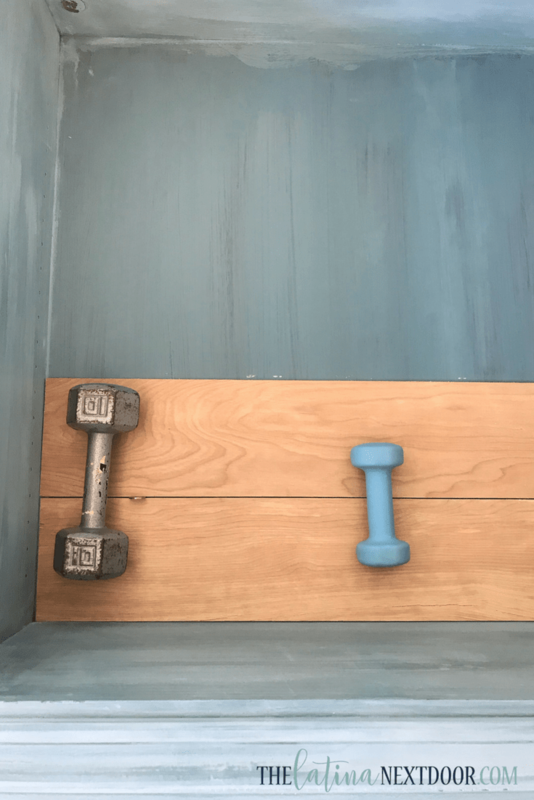 I laid the bookcase on it’s back and laid the shiplap down and held them in place with weights…using a nickel on either end in between the shiplap to leave an even gap. 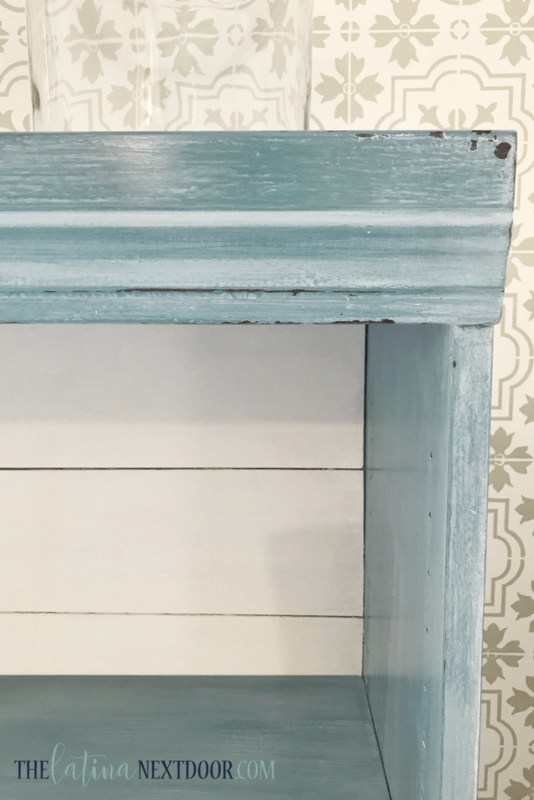 Then I took Debi’s Design Diary’s White Swan Chalk Paint and painted the shiplap white. I finally added a coat of Debi’s clear wax to the entire piece. Waited for it to dry for 24 hours and then came back with an old cloth and polished the bookshelves. The clear wax deepened the color in several areas to bring out even more contrast. And it made the bookshelves super smooth. I’m super proud of these!!!!! It has the perfect Hampton Farmhouse feel to me. And look amazing in my craft space. 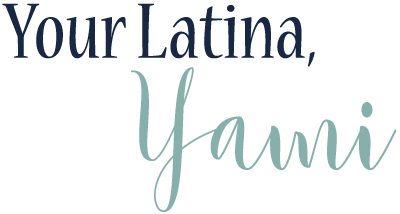 Make sure you subscribe so that you can follow along and see the progress on my craft room and how it’s all coming together! I’ve yet to use milk paint but the can of paint you used is so cute that I may have to find something to paint! Visiting from Thrift Store Challenge. Wow, the results is amazing. I love the color, the shiplap in the back, and the fabulous overall job you did. Wow! This looks amazing now! I love that you used nickels as spacers. What a smart idea. I can’t wait to find a table to makeover now! Thanks! Ooh, great update! I love the color you chose, my first milkpaint project is almost that same color. Adding the white shiplap at the back is beautiful and it really has a coastal look now. This looks awesome for your craft room! It is chic and farmhouse with major bling. I’m still scared of trying milk paint. But after all these awesome projects I have seen, I have to give it a try. Wow, that looks great! I love all your tips. Haven’t used milk paint yet, but others seem to be pleased with it. It was great before the addition of shiplap, but after…it’s super!! You did a spectacular job on this upcycle project. 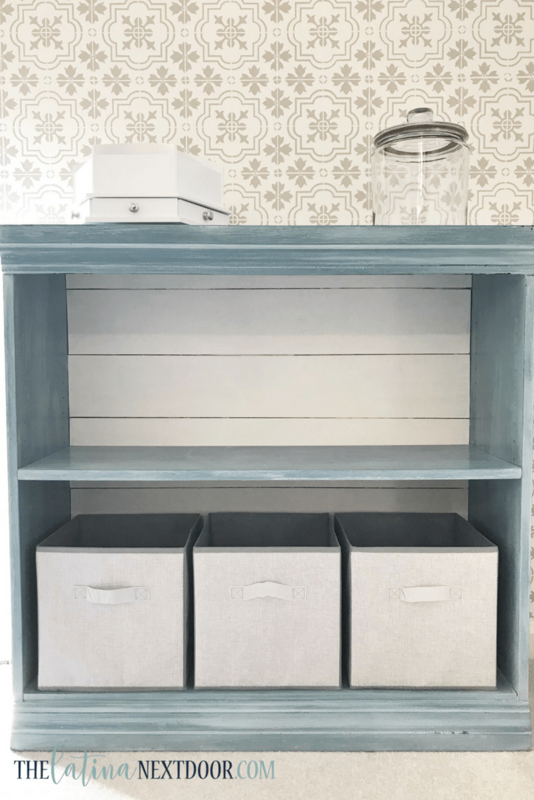 The new farmhouse styled bookshelf is so fabulous and I love the shiplap backing you did also. Thank you for sharing. 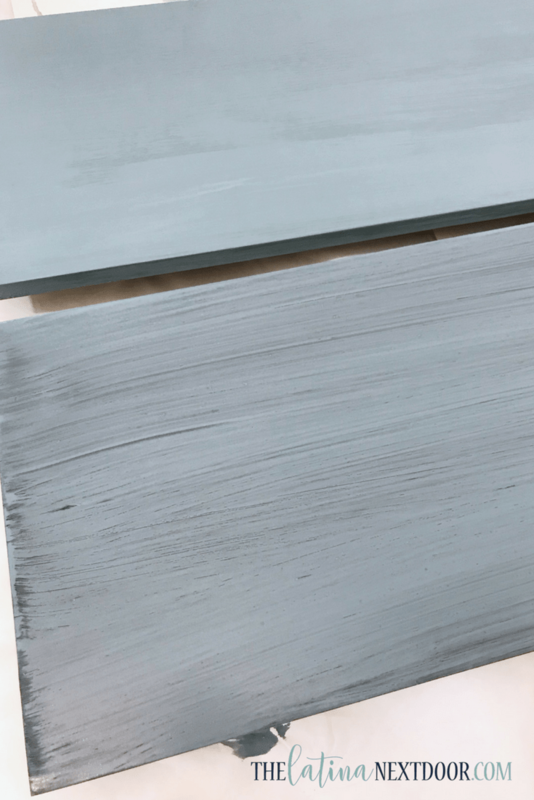 I always love the effect milk paint gives and it is always different. You created a nice beachy look from bland brown shelves. It looks great. Wow! I love the shiplap. That really added a great touch. The whole thing looks great and I love the color. I have had issues with milk paint in the past. Sometimes it works like a dream and the next project is a huge mess. It is hit or miss with it sometimes. But this is dreamy!